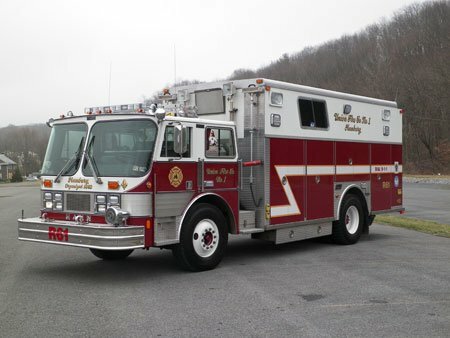 Rescue 61, also known as 61-4, is a 1986 Hahn-Saulsbury rescue truck. The unit features a Hahn 5 man cab, including 2 jump seats, and a Saulsbury stainless steel walk-in rescue body. The unit is the first due rescue truck for Interstate 78 for Windsor Township, Hamburg Borough, and Tilden Township. We also provide assistance to companies in Upper Bern and Greenwich Townships. The truck is equipped with a complete Hurst rescue system, including a hydraulic cutter, 32-inch hydraulic spreader, small, medium, and large hydraulic rams, and an air bag system. The unit also carries a variety of hand and air tools, an oxy-acetylene torch, generator, and complete scene lighting package.